Jeanne Olivier, a member of Connecticut Audubon’s Board of Directors, cuts the ribbon to officially open Deer Pond Farm in Sherman. She is flanked by Board Chairman Peter Kunkel, left, and Executive Director Patrick Comins. Photo courtesy of Sharon Cuartero. 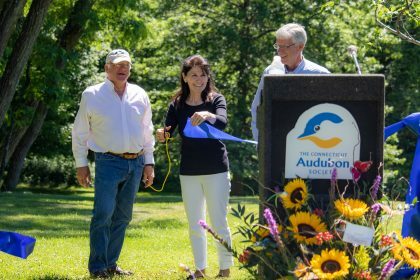 July 7, 2018 –After a year of preparation, the Connecticut Audubon Society’s Deer Pond Farm in Sherman opened its 10 miles of trails to the public today with a grand opening and ribbon cutting. The preserve, at 57 Wakeman Hill Road, Sherman, is now open from dawn to dusk, 365 days a year, hiking, birding, and nature study. Board Chairman Peter Kunkel, Board member Jeanne Olivier, Executive Director Patrick Comins, and Center Director Cathy Hagadorn welcomed almost 150 visitors on Saturday. In addition to the ribbon cutting, there were guided bird walks and a raptor demonstration by Skyhunters in Flight. Deer Pond Farm had been open only for guided walks in limited areas and at limited times. What visitors to Deer Pond Farm will experience is one of Connecticut’s great natural areas. The preserve occupies 835 acres in the highlands spanning the border of Connecticut and New York. Most of it is a deep forest of hills and hollows, with wooded swamps throughout, but there are also meadows and other grassy areas. Deer Pond Farm also offers spectacular views from a high point of 1,200 feet to the southeastern hills. The preserve lies half in Connecticut and half in New York. Connecticut Audubon acquired it in a bequest from the late Kathryn Wriston in mid 2017. The 10 miles of trails that are opening to the public are on the Connecticut half. Plans to open the New York half are still being worked on.